As the smallest state in Malaysia, Perlis is a place that is rich in its natural, cultural and historical aspects as compared to other bigger states. It is a great holiday destination for those who wish to stay away from the hustle and bustle of the city to relax in a natural environment. Located at the northwestern tip of Peninsular Malaysia, Perlis is bounded by Thailand and Kedah. 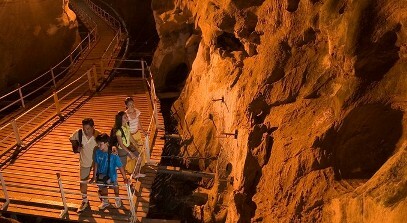 Located at Kaki Bukit, there is a 370-meter long limestone cave called Gua Kelam. Here you can go for an adventurous cave exploration where you will have to go on an 8-foot wide wooden suspension bridge to enter the cave. As you walk along, you will hear the squeaking bats and water dripping sound from the stalactites which is an interesting and exciting encounter. Visitors also should spend some time at The Snake and Reptile Farm located 10 kilometers north of Kangar. The farm is built for the research to develop serums for dangerous snakes’ bites. There are approximately 200 snakes of 34 species from Malaysia and other part of the world including King Cobra and python and about 10 species that is poisonous. If you are daring enough, you may try coiling snakes on your arm or shoulder while posing for pictures. Visitors may go for a sampan ride at the Melati Lake. It is located at the North of Kangar. You will be able to see what is in the lake when crossing the elevated walkways over the lake. With more than 150 sandbar islands all over the lake, visitors are expected to spend some time in the lake. Other than that, you may plan a picnic here while enjoying the lake scenery or go for a leisure walk. For those who love fishing, you should stop by at Kuala Perlis. It is a fishing town located at the estuarine delta of the Perlis River. You will see lots of wooden houses here along the riverbank, all occupied by fishermen. There is a wide range of handicraft selling at the Perlis Craft Cultural Complex at Kuala Perlis. Visitors can see a variety of Malaysian handicraft like the famous hand drawn batik, carved silverware and other assortments of handmade items such as basketry, ceramics, rattan products and many more. Visitor can climb to the top of the peak of Gunung Medan which is located 6 kilometers south of Kangar. It is also a popular picnic spot. There are walkways and stairways available for you to reach the peak. From the peak, you will enjoy a panoramic view of paddy fields, sugar cane plantations and clusters of islands near Perlis.